From 20-23 April 2017 we invite you to the Iluzjon cinema of the National Film Archive for the 14th edition of the Silent Movie Festival. It will be a rare opportunity to see some exceptional films screened to the accompaniment of live music! The festival opens with "Laila" (1929), a film made in Norway by George Schnéevoigt - a Danish director who for several years was also camera operator on Carl Theodor Dreyer's films. This picture is considered the crowning achievement of Norwegian silent cinema. It is a moving melodrama, reflecting the dominant trends in Scandinavian cinema during the 1920s and 1930s when filmmakers often made literary adaptations, with the photography shot in the vast landscapes showing off the beauty of the local nature. The live music for the film will be performed by Günter A. Buchwald - a world-famous composer specialising in silent film music. He will also be performing with the accompanying band at two more events - during the screenings of "Der müde Tod" [Destiny PL: Zmęczona śmierć] (1921) by Fritz Lang and "Дом на Трубной" [Dom na Trubnoy AKA The House on Trubnaya PL: Dom przy Trubnej] (1928) by Boris Barnet. For fans of German expressionism, we have prepared a marathon film evening when we will show "Die Nibelungen: Siegfried" [The Nibelungs Part I: Siegfried PL: Nibelungi: Śmierć Zygfryda] and "Die Nibelungen: Kriemhilds Rache" [The Nibelungs Part II: Kriemhild's Revenge PL: Nibelungi: Zemsta Krymhildy], a monumental and beautiful piece of art by Fritz Lang from 1924. The programme also includes two titles from the Soviet film school - the famous "Октябрь (Десять дней, которые потрясли мир)" [Oktyabr': Desyat' dney kotorye potryasli mir AKA October (Ten Days that Shook the World) PL: Październik (Dziesięć dni, które wstrząsnęły światem)] (1927) by Sergei Eisenstein and Grigori Alexandrov, produced at the request of the authorities on the 10th anniversary of the October Revolution, and a comedic satire by Lev Kuleshov - "Необычайные приключения мистера Веста в стране Большевиков" [Neobychainye priklyucheniya mistera Vesta v strane bolshevikov AKA The Extraordinary Adventures of Mr. West in the Land of the Bolsheviks PL: Niezwykłe przygody Mr. Westa w kraju bolszewików] (1924). This year's festival will also include some interesting propositions for Charlie Chaplin fans. The programme will feature screenings of two of his films from 1917 - "Easy Street" [PL: Charlie policjantem AKA Charlie się nie przejmuje AKA Ulica nicponiów] and "The Immigrant" [PL: Imigrant] - which are among his best productions from his time working with the Mutual Film Corporation. A real treat for fans of adventure cinema will be the screening of "20,000 Leagues Under the Sea" [PL: 20 000 mil podwodnej żeglugi] (1916) by Stuart Paton - an adaptation of Jules Verne's novel which used special effects ahead of their time, enriched with long sequences of underwater photography. In turn, fans of Polish cinema will find it a treat to see a film recently restored by the National Film Archive - "Halka" (1929/1932) by Konstanty Meglicki, one of three pre-war adaptations of Stanislaw Moniuszko's opera. The music for the film will be performed by an orchestra conducted by Jerzy Rogiewicz. This contemporary musical illustration uses excerpts from the 1932 sound version of the film, in which Jontek's aria was performed by Władysław Kiepura, brother of the famous Jan Kiepura. Closing the festival will be the film "Lord Jim" - the first adaptation of the famous novel by Joseph Conrad which was made in 1925 by Victor Fleming, later the creator of such unforgettable masterpieces as "Gone with the Wind" (1939) and "The Wizard of Oz" (1939). 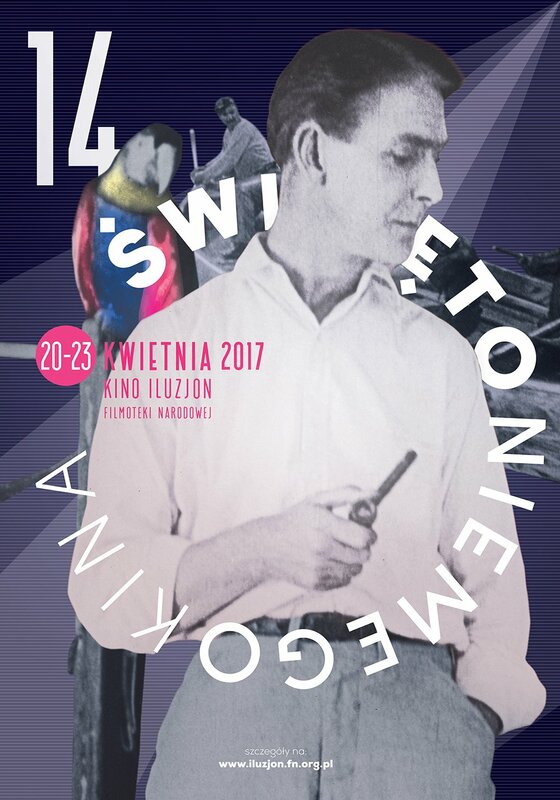 The National Film Archive has been organising the film-and-music Silent Movie Festival in Warsaw since 2003. During this year's edition of the event, we will present some outstanding films from the silent era to the accompaniment of jazz, classical, club and experimental music performed live by accomplished Polish and foreign musicians. Over the years, the festival audiences have had the opportunity to see dozens of unique titles, often completely unknown in Poland. In most cases, the films had undergone extensive restoration work to enable viewers to see the original material on the screen in the highest quality. Among the musicians participating in previous editions of the festival were Leszek Możdżer, Zbigniew Namysłowski, Michał Urbaniak, Maciej Maleńczuk, Aga Zaryan, Stanisław Sojka, Pink Freud, Pustki, Myslovitz, Voo Voo, as well as the Chamber Orchestra conducted by Rafał Rozmus. The thirteen editions of the festival have enjoyed great success - with the silent films accompanied by live music having been seen by over 70,000 viewers. The Silent Movie Festival will present movies from the rich and diverse collection of works from the silent film era in world and Polish cinema. It gives film fans a unique opportunity to see these masterpieces of the Tenth Muse which are so hard to find nowadays - and also on the big screen! The high levels of attendance and the enthusiastic reviews from the previous editions would confirm that silent cinema can still delight audiences. The basic condition is that it should be presented in an attractive form and with the participation of musicians of the highest calibre. The film tells the story of Laila - a young girl who, as a baby, was found by the hunter Jåmpa in the mountains after her parents had been attacked by a pack of wolves when taking her by sleigh to her christening. Luckily, Laila finds safety in the house of a rich reindeer breeder. We see how she grows up in the community of the Sami, the indigenous people of northern Scandinavia - and it gives us the chance to watch how they live and work every day in the wilderness. She also befriends the siblings from a family of Norwegian merchants, whose different culture fascinates her. Subconsciously she feels a close bond with them, not suspecting that they are related to each other. Critics have described the film as the crowning achievement of Norwegian silent cinema. It is a moving story that fits well with the dominant trends in Scandinavian cinema of the 1920s and 1930s, which were mainly literary adaptations made in the vast landscapes of the local nature. The filmmakers emphasised the impact of nature on the lives of the characters in their films and made it a fully-fledged character in their stories. "Laila", based on a nineteenth-century novel by Norwegian writer J.A. Friis, was the debut picture of its Danish director, screenwriter and actor, who was also camera operator on several films by Carl Theodor Dreyer - they made together, among others, "Blade af Satans bog" [Leaves From Satan's Book PL: Kartki z dziennika szatana] (1920), "Prästänkan" [The Parson's Widow PL: Wdowa po pastorze] (1920), "Der var engang" [Once Upon a Time... PL: Pewnego razu…” (1922), "Du skal ære din hustru" [Master of the House AKA Thou Shalt Honour Thy Wife PL: Będziesz szanował żonę swoją] (1925). The main role is played by Mona Mårtenson - a graduate of the Royal Dramatic Theatre in Stockholm, who had appeared a few years earlier in the famous "Gösta Berlings saga" [The Saga of Gösta Berling PL: Gdy zmysły grają] (1924) by Mauritz Stiller. In 1937, George Schnéevoigt made the sound version of "Laila". The film was intended to be a satirical comedy, making fun of the American image of Soviet Russia. The main character is a bourgeois American - Mr. West - who decides to go to the Soviet Union. His relatives and friends try by all means possible to dissuade him from - in their view - a highly risky undertaking, but West does not give up. He only takes a bodyguard - a cowboy named Jeddy. This doesn't help much because, after they arrive in the Soviet Union, the cowboy disappears somewhere - as does Mr. West's wallet. In addition, a mysterious man, introducing himself as a victim of the Soviet regime, tells West about the insidious plans of the Bolsheviks against the American visitor. Lev Kuleshov, director and film theorist, created his work on the basis of the theory which assumes that the key to film-making is the editing - with much less importance ascribed to the images themselves. It held that the method of joining together successive shots is most important, and the aim should be to control the feelings of the viewer. "The Extraordinary Adventures of Mr. West in the Land of the Bolsheviks" was intended as a double satire: on the one hand, it was aimed at the anti-Soviet propaganda of the western capitalist press, but on the other hand, it was supposed to be a parody of American slapstick and western movies. This movie by Konstanty Meglicki is one of three pre-war Polish adaptations of Stanislaw Moniuszko's opera about the unrequited love of Halka, a peasant girl, for the young master Janusz Odrowąż. But this is not a faithful adaptation of Moniuszko's work. Jerzy Braun used only the main themes of the libretto in his scenario. In 1932, the film producer decided to add sound to "Halka". Władysław "Ladis" Kiepura, brother of the famous Jan Kiepura, sang Jontek's aria. The silent adaptation of "Halka" has not previously been available to a wider audience - only the final four minutes from the original version of the movie have survived until today. The collections of the National Film Archive also contained large parts of the working materials for the later sound version.The first step in the process of restoring the film was the conservation of the more than eighty-year-old film stock and preparing it for scanning. Then all fragments were placed next to each other and compared. The restoration of "Halka" was one of the biggest challenges faced by the National Film Archive. The existing materials are of variable quality, incomplete and coming from two different versions of "Halka". Since there is no surviving documentation for the film, the National Film Archive attempted to put together a cut of the film - in the spirit of the era - from the preserved fragments. The soundtrack for the film has also been preserved only in fragments. As the film was originally silent, the National Film Archive has decided to present it to the modern audience in this version of its own.It is a modern musical illustration, developed by Jerzy Rogiewicz, which features excerpts of the historical soundtrack from 1932. Lang's work is a four-part story about destiny determining human life. Fate is shown here in the form of death, separating two lovers. The girl, who cannot come to terms with the departure of her beloved, ends up in the kingdom of Death and asks him to revoke his cruel judgment. Death makes her a deal: if she manages to save three human lives, the judgment of destiny will be revoked. At this point, the narrative structure is broken into three separate episodes - taking place in succession in the Arab world, in Renaissance Venice and in China - all maintained in the convention of a ballad, imbued with the fatalism typical of expressionism. "Destiny" is the first picture by Fritz Lang which brought him international fame. The film stands out for the precision of its directing skills, the spectacular mise-en-scène, its imaginative and architectural artistry and the sense of social observation. Also remarkable is the performance of Bernhard Goetzke as the title character afflicted by pain and tragedy. His co-star was Lil Dagover - the first lady of expressionist cinema - who had previously appeared in "Das Cabinet des Dr. Caligari" [The Cabinet of Dr. Caligari] (1920) by Robert Wiene. "The Immigrant", which quite bravely took on the subject of disillusionment with mythical America, is one of the most successful of Chaplin's productions from his time cooperating with the Mutual Film Corporation. During his eighteen-month contract with them, Chaplin made twelve comedies. He had at his disposal his own, highly-modern studio, and he also managed to obtain full creative freedom and control over every aspect of the production. His films became more mature, more precise in form and more ingenious in the construction of the gags. This period in Chaplin's work also stood out for his "coming outside" - onto real American streets. In many scenes from these films, his character would come into contact with ordinary people, with the everyday lives of average Americans. In this production, which is regarded as one of his best productions from his cooperation with the Mutual Film Corporation, Chaplin plays a rookie cop helping the forces of law and order to maintain order on the streets. His heroic attitude wins him respect and recognition from the local residents, and also paves the way for him to win the heart of a beautiful girl. The Easy Street from the title was a replica of the London street where Chaplin lived as a child. "The House On Trubnaya" is considered one of the best films made by Barnet, who was a student of Lev Kuleshov - founder of the so-called experimental laboratory at the Moscow Film School (VGIK).He presented the realities of the NEP (New Economic Policy) with an ironic tone, thus highlighting the absurdities of the Soviet reality of the time. The main character is Golikov - a barber, and owner of a thriving private hair salon. He employs as a maid a young girl named Paranya, because - so he thinks - it is required by his social position. After a number of humorous, even grotesque, events, Paranya joins a trade union, which takes on her employer. The value of the film lies in its picture of Moscow from the 1920s, the authentic scenes of streetlife and the rich gallery of different people. The film also includes interesting attempts to parody domestic cinema, such as in portraying the crowd in the style of Eisenstein, or the tram ride which brings an obvious association with the poetry of Dziga Vertov. The film features exquisite characters created by Vera Maretskaya as Paranya and Vladimir Fogiel as Golikov - and for the actor it was one of the last roles in his rich career. A monumental adaptation of "The Song of the Nibelungs", an old Germanic epic about heroism, love, crime and bloody revenge, consisting of two autonomous parts, different both stylistically and in terms of their plots. In the first one, heroic Siegfried kills a mighty dragon and by bathing in its blood makes himself invincible. He arrives at the castle of the king of the Burgundians and asks for the hand of Kriemhild. The condition for marrying her, however, is to help the king to gain the favour of the beautiful and bellicose Brünnhilde - the queen of Iceland, who will only give her hand in marriage to the one who beats her in a spear duel. Siegfried, pretending to be the king, wins the duel. When Brünnhilde learns about the deception, it leads to a bloody clash. In the second part, we witness the cruel vengeance which Kriemhild vows over Siegfried's grave. The heroes of the epic tale are killed in a massacre, the result of a desperate desire for revenge at all costs. Paradoxically, Lang - the maker of movies which acted as a kind of diagnosis of the illness of the German spirit - made a film with the style and imagery which was soon to become the model for official Nazi propaganda productions. The attempt to capture the so-called essence of the Germanic spirit that Lang made in the "Nibelungs" became for Goebbels one of the most important duties of art, not just cinema. However, the film's makers had primarily intended to improve the social atmosphere in a country which was struggling with the effects of the First World War and economic chaos.The thirteenth-century knightly epic, in the eye of the director, was to function as a peculiar kind of catharsis, praising the bravery of the Old Germanic tribes and showing a bright vision of fortitude and the courage of past heroes.As the screenplay intended, Lang took care to make sure that the course of events in "The Nibelungs" was presented in the most attractive form. A very important part of his work was the production design and architecture of the studio sets, which clearly referenced many famous works from European art. An adventure movie with elements of science fiction, based on the plot of the second part of the famous trilogy by Jules Verne. The story focuses on the adventures of Captain Nemo, who has constructed a submarine called the Nautilus in order to track down his bitter enemy - Charles Denver. On behalf of the US government, a French scientist named Professor Aronnax sets off in search of the legendary ship. He is to investigate the case of the mysterious Nautilus, which is believed to be a sea monster hiding in the depths of the ocean. The film still surprises even today with its special effects, which were very impressive for the time, and above all with its use of long sequences of underwater photography, which were only possible thanks to a special water-tight chamber invented by the brothers Ernest and George Williamson. Fleming's film was the first adaptation of Joseph Conrad's "Lord Jim". The director made a faithful transfer onto the screen of the themes of the novel, which raises the subjects of honour, responsibility, guilt and its redemption. The screenplay captures both the composition of the novel, as well as its multi-layered narrative. Jim, first officer on the ship Patna, which is carrying Muslim pilgrims to Mecca, flees the deck of the ship when it collides with an abandoned wreck. He is brought before the court of the Maritime Chamber and loses his certificate to practise the profession. After several years of setbacks and struggles with the tag of coward weighing heavily on him, with the help of a friend he arrives on the island of Patusan, where no-one knows about his past. He quickly gains the trust of the ruling Rajah and the natives - and he becomes their friend and adviser. One day, some pirates land on the island in order to rob the local people. It turns out that the head of the gang is Jim's former colleague from the crew of the Patna, who had influenced his decision to desert. Jim is appointed by the Rajah to deal with the robbers. His conscience tells him he should give them a chance to leave the village in a peaceful manner. Unfortunately, the pirates do not keep their side of the deal and they kill the Rajah's only son who, along with other villagers, was guarding the mouth of the river. Embittered, the Rajah decides to take revenge on Jim for the consequences of his decision.